Thursday, April 11th 1889 I finished the berry bushes in the morning and done some other work. I helped Adda wash in the afternoon and we put part of the clothes in the garret. We had a heavy rain tonight. Lee got home from Berlington. Mother will come Monday. Friday April 12th 1889 I was busy about the work most of the forenoon. I wrote a letter to Mother. Adda ironed what clothes were dry and put the rest in the garret. I began to put my quilt together in the afternoon and worked at it all evening I had a letter from Maggie Stewart. Mr. Pierce went home tonight. Saturday, April 13th 1889 I was busy about the house work most of the forenoon. I sewed a little. After dinner I worked out with my chickens and in the berry bushes till nearly four oclock. I finished putting my quilt together before bed-time. weather chill & windy. Sunday April 14th 1889 I was working with my chickens some in the morning and we got an early dinner for Will go up in the country for a hired boy he came back about four oclock bringing one with him. I helped get supper and read in the evening. Monday April 15th 1889 I helped Adda some with the work and went to town to order groceries and get some things I needed. I was down to Halts awhile Robbie was better of the mumps. I found work that kept me most of the about the kitchen. Mother came home from Berlington in the afternoon. I talked with her in the evening. Tuesday April 16th 1889 We washed this forenoon and in the afternoon I was working out doors a little and Will helped me burn the leaves on the hillside. He finished the door yard fence today. 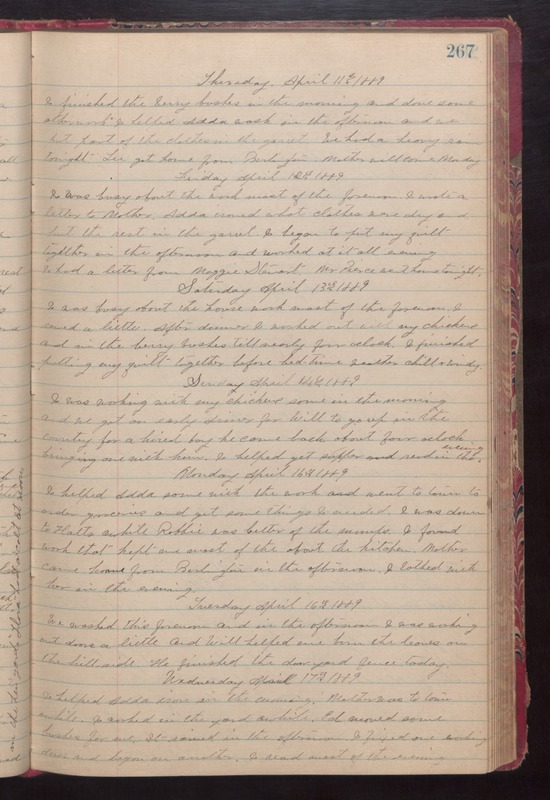 Wednesday, April 17th 1889 I helped Adda iron in the morning. Mother was to town awhile. I worked in the yard awhile. Ed moved some bushes for me. It rained in the afternoon. I fixed one working dress and began on another. I read most of the evening.